CFR’s Paul Swartz has a whole passel of horrifically grim charts for you today. Bottom line: our current recession is the worst since World War II by practically every measure. And on some measures, it’s even worse than that. 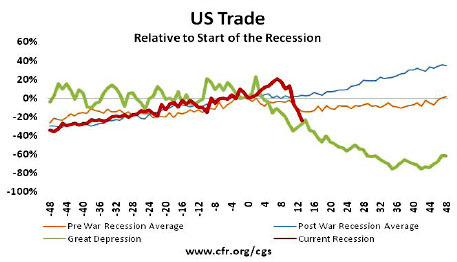 U.S. trade, for example, is now collapsing at nearly Great Depression velocity. Eichengreen and O’Rourke concur. The only good news is that we’re responding to events better than our ancestors did. We hope.